CORE VALUES: How To Personally Possess & Pass Them On. 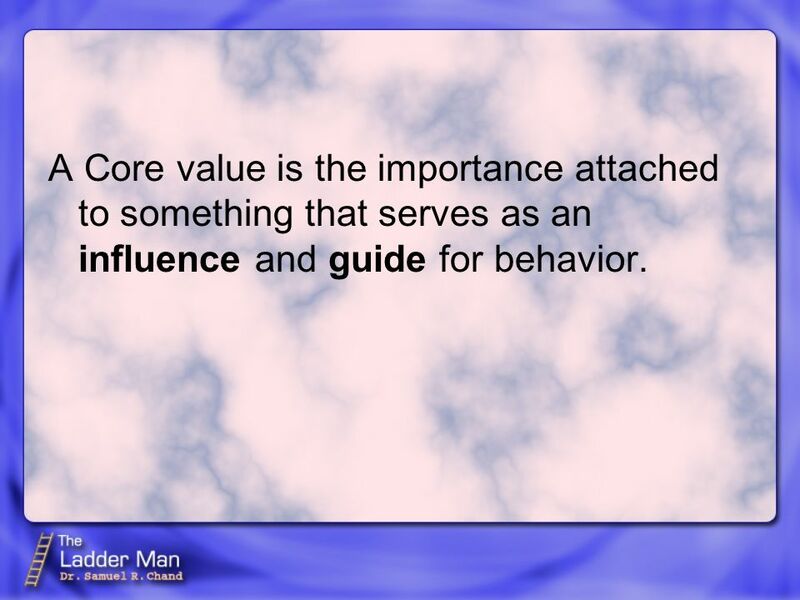 2 A Core value is the importance attached to something that serves as an influence and guide for behavior. 3 1. 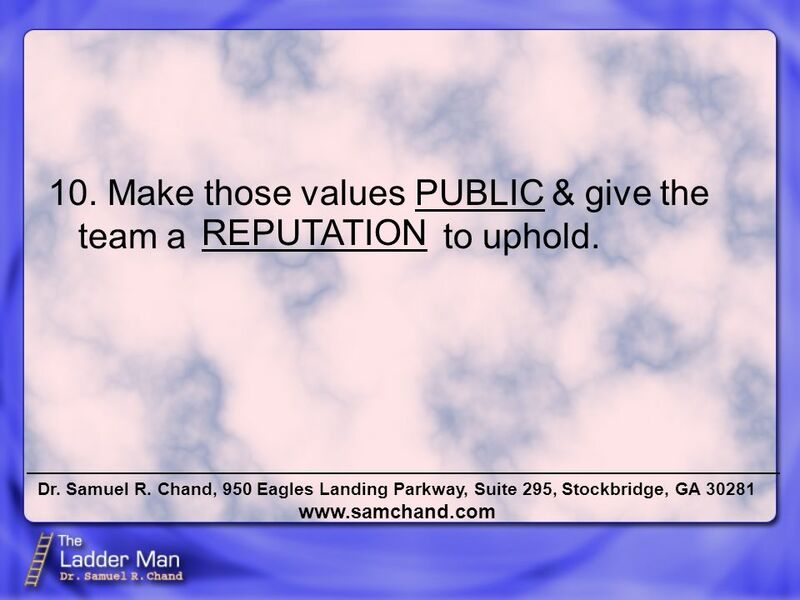 ARTICULATE & these values.LEARN 2. Compare &VALUESPRACTICES. 3. 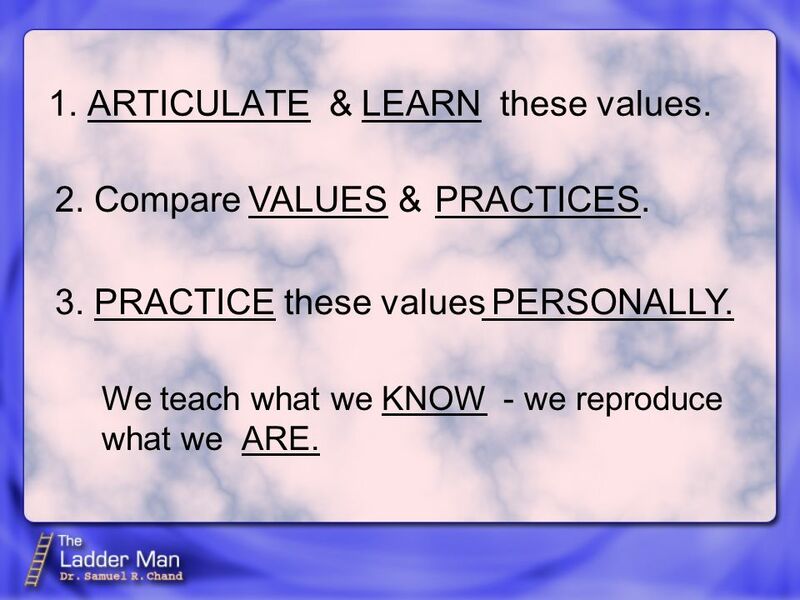 PRACTICE these values We teach what we - we reproduce what we PERSONALLY. KNOW ARE. 4 4. Practice these values as aTEAM. Shared define the team.VALUES 5. TEACH these values to others. 6. 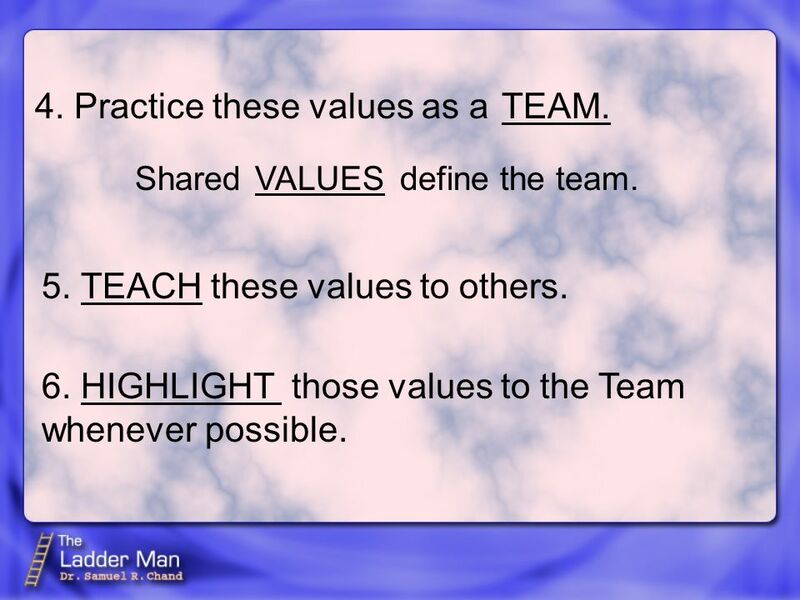 HIGHLIGHT those values to the Team whenever possible. 5 7. LOOK for opportunities to recognize team members who live these values. PUBLICALLY 8. 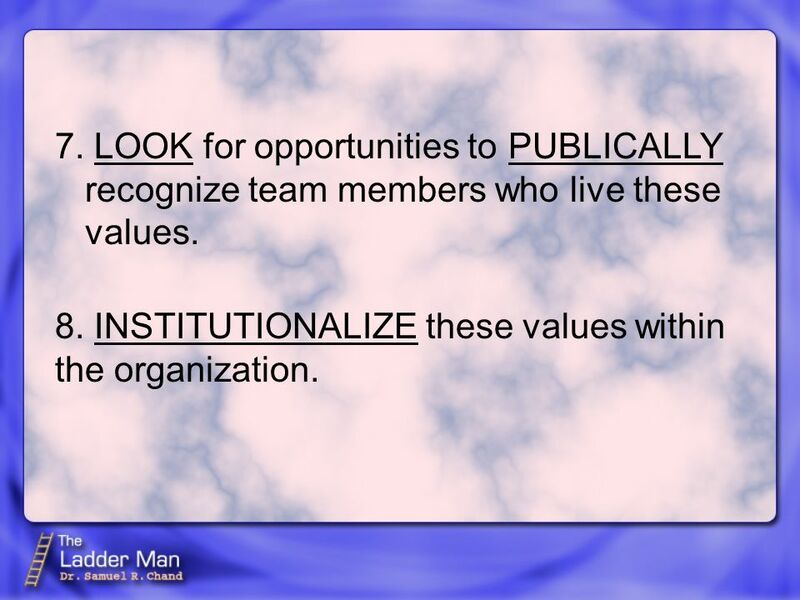 INSTITUTIONALIZE these values within the organization. 6 9. Monitor - what gets MEASURED gets done! 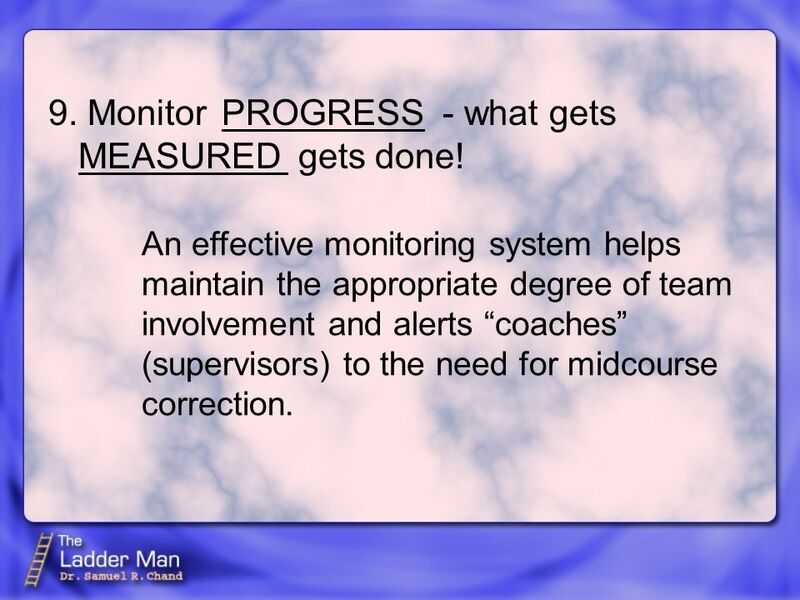 PROGRESS An effective monitoring system helps maintain the appropriate degree of team involvement and alerts coaches (supervisors) to the need for midcourse correction. 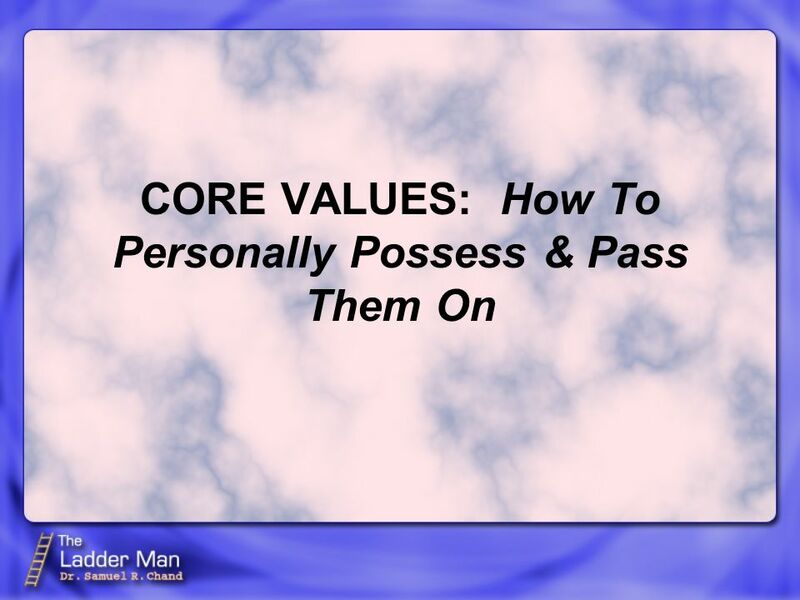 Download ppt "CORE VALUES: How To Personally Possess & Pass Them On." 12 SUCCESS FACTORS FOR AN ORGANIZATION Dr. Samuel R. Chand. Assessment Literacy Kentucky Core Academic Standards Characteristics of Highly Effective Teaching and Learning Career and College Readiness MODULE 3. HOW TO MAKE THE TOUGH CALL Dr. Samuel R. Chand People calls are the toughest calls. Pssst … time to Google/FB yourself. Do you like what you see? Will your employer? LEADERSHIP'S GREATEST CHALLENGE Dr. Samuel R. Chand. Supporting the Art & Science of Teaching Supporting the Art & Science of Teaching Robert J. Marzano. ASSESSMENT LITERACY PROJECT4 Student Growth Measures - SLOs. So What Are We Doing About It? Woodland Intermediate School Response to Concerns. Failure to Success Samuel R. Chand. PSALM 37 I. Failure is a experience, but we keep responding to it in ways. COMMON UNHEALTHY. NOTES: ASQ Baltimore Section 0502 Breakfast for Quality Champions Series September 18, 2003 Dr. Rick C. Brocato Associate Professor of Management Mount. Life Story What’s That? Who Cares? Life story is an account of the series and events that make up your life and define who you are Life story reinforces.